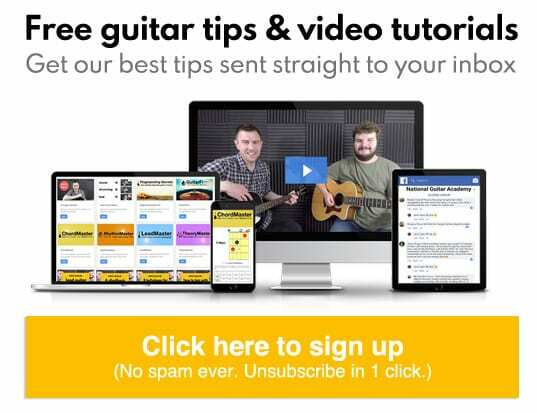 Wondering how to play electric guitar? This guide will get you up to speed quickly. There are hundreds of different models of electric guitar and it would take years to explain each one, but there are common components. This is where we play chords or ‘fret’ (press down) notes. This is what holds our strings in place and is usually placed on the bottom of the guitar. The ‘Floating Bridge’ usually has a ‘tremolo arm’ which is used to change the pitch of your guitar. If you press it down the pitch of your note gets lower, if you raise it the pitch gets higher. These are really useful for keeping your guitar solidly in tune as they don’t change the pitch of your guitar. These are used to change the pitch of each string. These are what ‘amplify’ your guitar and allow it to be heard through an amp. You can get a variety of different pickups, but the main ones are either ‘Single coils’ or ‘Humbuckers’. These create a thinner sound but are great for blues, funk or pop! They are often seen in Fender Stratocasters or Telecasters. These sound a lot thicker than a single coil, so are great for heavier styles of music such as Rock, Metal or even blues. They are often seen in Gibson Les Paul’s or Ibanez guitars. This is how we to select each pickup on our guitar. This can be incredibly useful as it provides a wide variety of sounds! On most guitars we have a ‘neck’ pickup and a ‘bridge’ pickup. The ‘neck’ pickup is the one closest to the Neck and has a softer, warmer sound. The ‘Bridge’ pickup is the one closest to the bridge and has a brighter, aggressive sound. Volume is what controls the overall level of your electric guitar. Tone controls determine whether your guitar has a bright or dark sound. If it is rolled all the way off the sound is darker, if its on full the sound is brighter. This is where you plug your guitar lead into which then goes into an amp. Before we get started on learning some great guitar riffs, we need to have a great amp sound. Without this, it can be impossible to sound good! If the amp sound is bad, this can often un-inspire us and lead us to think we’re playing badly when we’re actually not. However, if we have a great amp sound, this does inspire us and lets us rock out to our heart’s content. When setting up our amp, we often use specific sounds for certain songs. So if we’re playing a Beatles sound, we would want a clean sparkly sound. Where as if we were rocking out to some AC/DC we might want something a little bit heavier. Dialling in the right sound when playing electric guitar is vital to sounding good. This can often be daunting as there are so many different knobs and buttons and amps it can be hard to know where to start. So lets start simple and break down each one. Every amp is different, and some have hundreds of different buttons which do crazy things. However 90% of guitar amps will have these controls. This controls how much overall distortion you want. The more the knob is turned down the less you have, more its turned up the more distortion you have. This controls how ‘bassy’ you want your amp to be. This can come in really handy for when you want to sound huge! But use it sparingly. The ‘Bass’ control adds a lovely thud to your guitar sound. This controls the ‘mids’ of your guitar. This adds thickness to your sound and really helps you cut through in a band! You may find the more you turn it up the ‘honkier’ your guitar sound gets. This controls how bright you want your guitar to sound. This is really good for clean sounds, as it adds ‘sparkle’ to your guitar. A lesser known tone control, however really important as it adds more brightness to your sound. It’s like the treble control, but more. Really great for those funky crisp guitar lines. Now we understand what our amp does, let’s look at getting a great guitar sound. We’re going to look at two guitar sounds. A super high gain sound, perfect for metal or rock. A jangly clean sound, great for pop or indie. Sometimes your amp may have a separate channel for your distortion, make sure you check you are on the right channel before you dial in your sound. You would use this sound in a rock song or a metal song. Notice how the gain isn’t all the way up, it’s only just over half way. This is super important, as if we have too much distortion our guitar sound can get lost and will often sound messy. I’ve also used a bit of bass to give our guitar sound some low end and some middle and treble to make it nice and clear! You can adjust volume to taste. Playing with tons of distortion is one of the most fun things you can do on the guitar, but sometimes it’s nice to chill out and play some clean guitar. This sounds great playing Beatles songs or modern indie. Here’s how you would dial in your amp to get this classic tone. Notice how the gain is relatively low, we want minimal to no distortion. As well, I’ve used less Bass and mids. But more treble and presence to get a nice sparkle. Even though the Electric guitar is very similar to an Acoustic Guitar. A number of chords sound better on Electric than Acoustic and vice versa. One key chord type which is essential for Electric Guitar is the power chord. This is a chord which isn’t used very often on Acoustics, however we hear this all the time on Electric Guitars. This is a chord which only uses two notes and sounds absolutely huge on an Electric Guitar. There’s nothing more satisfying than hitting a huge power chord through a loud distorted amp! The main reason for playing power chords on Electric Guitar rather than open chords, is they have a beefier sound. 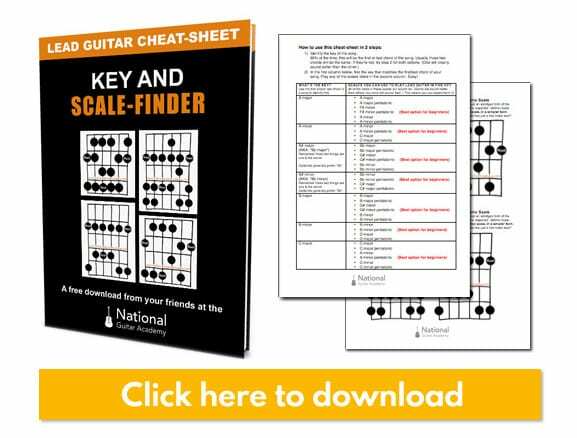 Let’s take a look at a few power chords and compare them with our open chords. 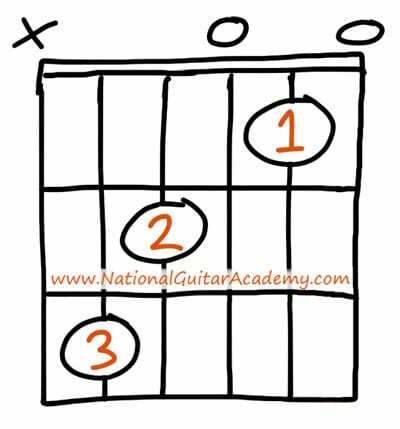 There are tons of different ways to play an E Guitar Chord, this article explains a few of them. Do you understand this Chord Box? No problem if not, you can learn all about them here. Strum the low E string and the A string. It’s really important you only strum the E and the A string, as the power chord only has two notes. If we strum anymore than this it’s a different chord. So make sure you really concentrate on strumming JUST those two strings. Another really cool tip is to use the rest of your finger to mute the remainder of the strings. I explain that in this video here. Here’s what a normal open ‘A Chord’ looks and sounds like. 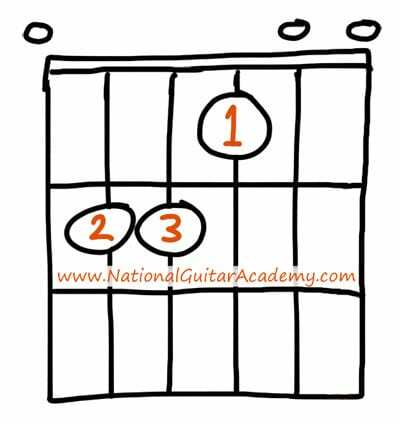 The A chord is a fantastic beginner chord and there are lots of different ways to play it, this article explains three great ways to play an A chord. Strum just the A and D string together. 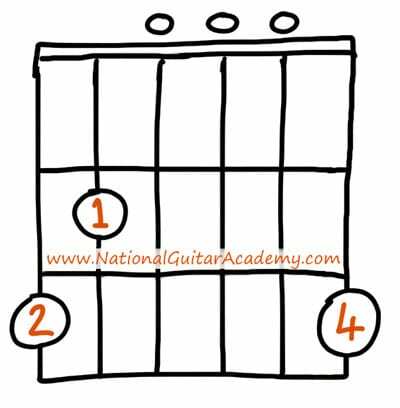 Here is what our normal G Chord looks and sounds like. 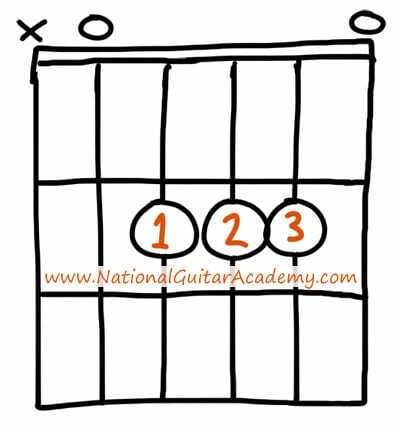 The ‘G Chord’ is a great beginner chord and there’s more than one way to play it. This article explains a few of them. Place your first finger on the 3rd fret of the low E string. Place your fourth finger on the 5th fret of the A string. Play just the E and A string of your guitar. Here is what our C chord looks and sounds like. The ‘C Chord’ is a little bit harder than the other chords, but that’s not a problem. There’s always an easier way! Some of those are explained in this article. Place your first finger on the 3rd fret of the A string. Place your fourth finger on the 5th fret of the D string. One thing that electric guitars are good at doing is sounding huge with very few notes. We’ve just proven that we can do that with chords. If you want to learn how to play electric guitar this is a must-know technique. We can also do that with single notes. Now let’s take a look at some killer single note riffs which sound absolutely huge on Electric Guitar! This is an awesome iconic riff by Led Zeppelin, it only uses single notes and sound massive. Here’s how to set up your amp to sound like Jimmy Page, make sure you’re on your Distortion channel. Another iconic rock riff which mainly uses power chords to sound absolutely huge! 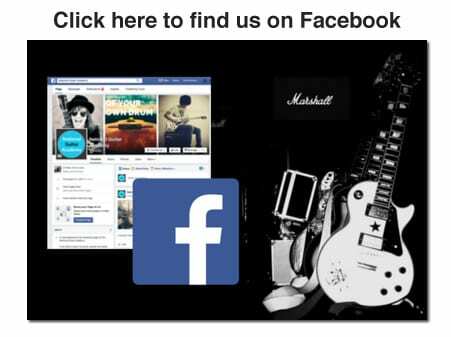 Here’s how to set up your amp like Joan Jett, make sure you’re on the Distortion Channel! Guitar Riffs are awesome and they’re one of my favourite parts of Guitar playing. Check out these great articles by Music Radar which tells you about The Top 50 Guitar Riffs Of All Time. 3 Killer Techniques to make you sound like a guitar god! Now we’ve learnt a couple of iconic riffs, lets take a look at learning some quick techniques which will make you sound like a electric guitar god! This is an awesome technique and is heard loads in rock music. Not only does it sound great, it’s super easy and will make you sound like a rock star in a matter of seconds. This is an essential trick in learning how to play electric guitar. Another cool trick with Pick Sliding is to add a little bit of Reverb to your slides, this creates a ‘soundscape’. Volume swells are another great way to add dynamics and texture to your already awesome guitar chops. I love it as it makes your guitar almost sound like a violin! In this video I explain a bit more about how to do this essential Electric guitar technique. As well as this you can add reverb to add ambience or effect to your already-awesome guitar tone. This technique is a little bit tricker, but is essential to learn as it will provide speed and clarity to our electric guitar playing. In this video I talk a little bit more about the importance of alternative picking and why it is SO useful in learning how to play electric guitar. Check out this killer downloadable power pack which will enhance your practice routine!